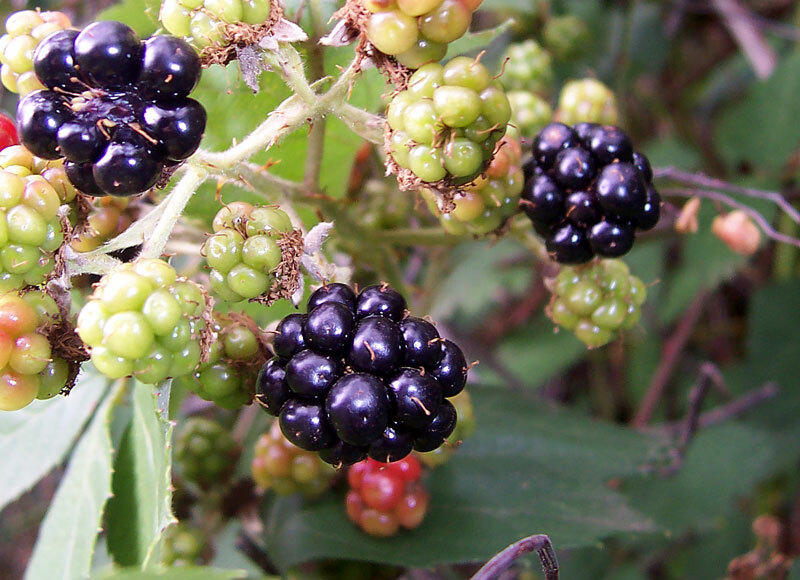 The best blackberries are wild ones, picked in the heat of summer from brambles in a fence row or along the side of an old dirt road. The wild ones just have more flavor than domesticated ones. That squirt of purple juice is richer and sweeter than any strawberry. When we lived on the farm Mother and I picked quarts of them every summer. This was an ordeal. Mother always carried a stick in case there were snakes, but the real enemies were chiggers and ticks. We would dress in long sleeves and long pants, socks and shoes, sweating in the heat, in an effort to foil them. The blackberry bushes were full of thorns and stickers to tear at your hands. I always emerged with scars. But the end result of all the blood and labor was blackberry cobbler. Here is my mother’s easy cobbler recipe. You can use any fresh or frozen berries, except I don’t recommend strawberries. Spray bottom of a 9″ x 12″ baking dish (like Pyrex) with Pam or other oil spray. Mix all dry ingredients in baking dish. Add milk, stir well. Pour melted butter over dough. Place sweetened berries on top. Bake at 350 degrees until top is brown, 45 minutes to 1 hour.